Everyone here seems to be on it. You see people in the hostels, on tour buses, wherever, with their maté cups (in various styles, usually gourds) with the metal straw, a thermos flask of hot water and containers of dried yerba maté and sugar (or liquid artificial sweetner, which the Argentinians also seem to love). It's caffinated, so probably addictive, which is why they're all so into it. All the hostels we've stayed in here have flat sheets instead of fitted sheets over the mattresses. Why?! Flat sheets are not long enough to get tucked in properly to the ends of the bed and always end up coming out and getting tangled up. Fitted sheets, people. Learn 'em. Get 'em. Love 'em. 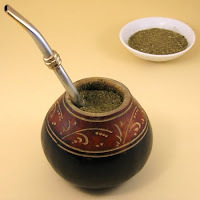 Mate? I remember that from my youth. some of these cups can be quite the art work.